Challenge Vault is a project I have been working on for about 8 months, and it is finally time to make it public! 1) The business side. There was a hole in the ability to create online challenges quickly, easily and for little cost. Engaging customers with a product or service is the best form of marketing. But up until now, creating an online challenge was a difficult, expensive task – one that only the larger companies could pay for and pull off. 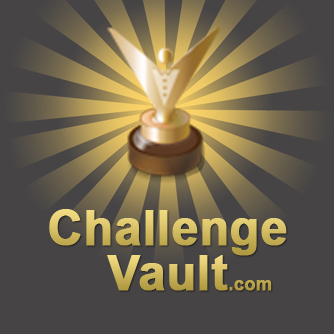 Challenge Vault now makes this easy and inexpensive for any company or organization. Each challenge page & associated answer can be themed with a company’s brand with a background image and banner ad. 2) We all build off of each other. Because the Internet has opened our view worldwide, the opportunity to build off of the best – wherever they may live – has grown a tremendous amount. Challenge Vault is all about getting off our duffs and creating something new and innovative. This is the really exciting part to me. The beautiful part about for businesses is that when a player accepts a challenge, they get their friends to vote for them so they can win. How do they do that? Facebook, Twitter, email. This is free advertising for the business or organization. They create the content centered around your brand, they distribute your brand through their social media channels, and they encourage others to do the same. Build a challenge around a brand name, like Mo’s Restaurants. They have had the same radio jingle since the 70’s and need a new one. The winner will get a dinner for four and the jingle will be played on the air. A recording artist could challenge his/her fans to write lyrics to which the artist will write the music. Looking for a particular talent and need a pool of people to choose from? Put up a challenge to complete a certain task. From there you will receive entries of people who have the necessary skill, and a pool of potential applicants for future projects or positions. Create a video involving your brand and stop half way. Challenge your customers to finish the video. And this is only the tip of the iceberg. I have come up with MANY more uses that would engage customers. What about price? A non-themed challenge is free and always will be. Normally a themed challenge – adding a background image and banner ad – would cost, but as I am more focused on getting usage, even that is free for now – but not for too long. So if you want to take advantage of this and really engage your customers, members, students, family members, friends or any other group, jump on right now and create your challenge. If you need help, let me know and we can put together the perfect challenge! I hope you have as much fun with it as I do!